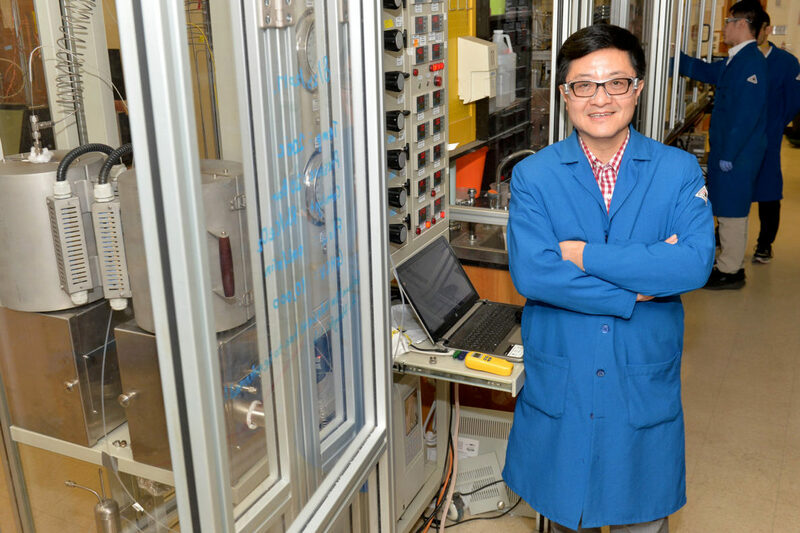 PULLMAN, Wash. – Researchers at Washington State University, University of New Mexico, Eindhoven University of Technology, and Pacific Northwest National Laboratory have developed a catalyst that can both withstand high temperatures and convert pollutants at near room temperature – an important advance for reducing pollution in modern cars. They report on their work in the journal, Nature Communications. Catalytic converters have been used in the U.S. since the 1970s as a way to clean up pollutants from vehicle exhaust. In the catalytic process, rare metals, such as platinum, are used in a chemical reaction to convert carbon monoxide and other pollutants to non‑toxic carbon dioxide, nitrogen, and water. As cars have become more fuel‑efficient, however, they use less energy and the temperature of the exhaust gases is lower, which makes it harder to clean up the pollutants. In fact, the U.S. Department of Energy has set a goal of removing 90 percent of harmful emissions at 150 degrees Celsius or lower. The catalysts have to perform at low temperatures but also must survive under the harsh conditions encountered during operation. “The catalyst problem has increased paradoxically as cars have become better and more efficient,” said Emiel Hensen, catalysis professor at Eindhoven University of Technology. Meanwhile, the industry also struggles with the high cost of the precious metals required for catalysis. Platinum, for instance, facilitates chemical reactions for many commonly used products and processes but costs more than $800 per ounce. The catalyst the researchers developed is based on the activation of single atoms of platinum supported on cerium oxide. While their catalyst outperforms current technology, it also reduces the amount of platinum required, which would lower overall costs. “The industry wants to make use of every single atom of the precious metals, which is why single‑atom catalysis has attracted increased attention,” said Abhaya Datye, a distinguished professor at UNM’s Department of Chemical and Biological Engineering. In their latest work, the researchers first ensured their catalysts were thermally stable, trapping platinum ions on a cerium oxide support at very high temperatures. Their synthesis method caused the platinum atoms to strongly bond to their support. They then activated the catalyst in carbon monoxide at about 275 degrees Celsius. “To our surprise, we discovered that the high temperature synthesis made the ceria more easily reducible, allowing it to provide a key ingredient – oxygen – to active sites,” said Yong Wang, Voiland Distinguished Professor in the Gene and Linda Voiland School of Chemical Engineering and Bioengineering at WSU. The activated oxygen was then able to remove pollutants at near room temperature at the platinum sites. The researchers now plan to study the performance of single‑atom catalysts with other organic compounds and pollutants. The work was funded by the U.S. Department of Energy’s Office of Basic Energy Sciences and Netherlands Research Center for Multiscale Catalytic Energy Conversion.